Canberra is a planned city designed to cope with flooding, despite encompassing the Molongolo, Ginninderra, Limestone and Tuggeranong Plains. Early adoption of appropriate planning, development and engineering standards has by and large protected us from the most serious of events. Canberra has a stormwater network including pipes, channels, water quality pond embankments and weirs, but ultimately some flooding is inevitable where there is any kind of water catchment such as a river, creek, canal, lake or dam. 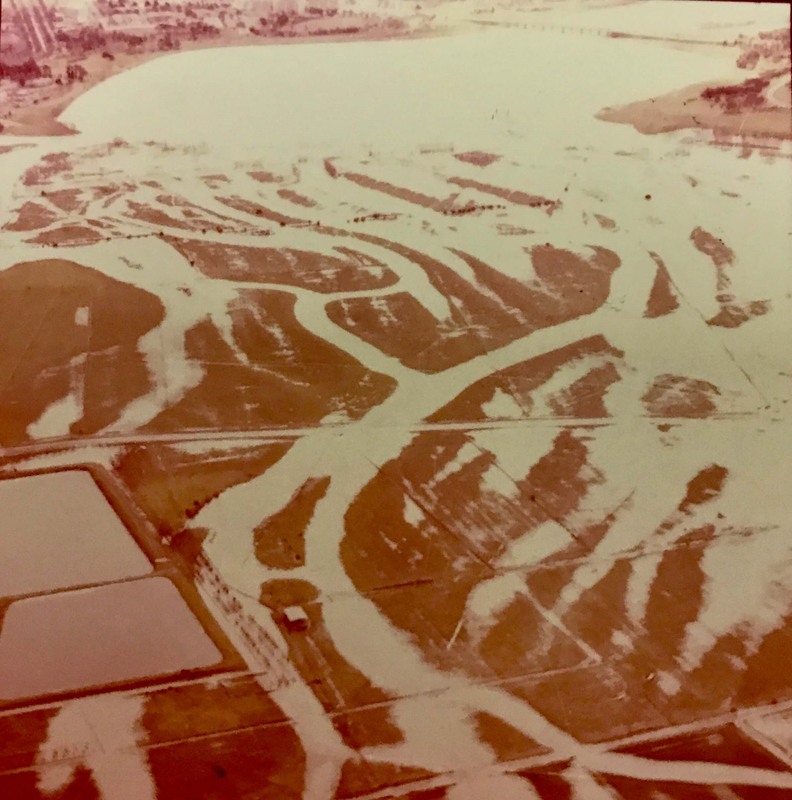 While the natural water courses that form the Territory landscape have provided the means to create some of the most beautiful features of our city, such as Lake Burley Griffin, flooding as the result of natural disasters has seen these same water courses damage our built environment. 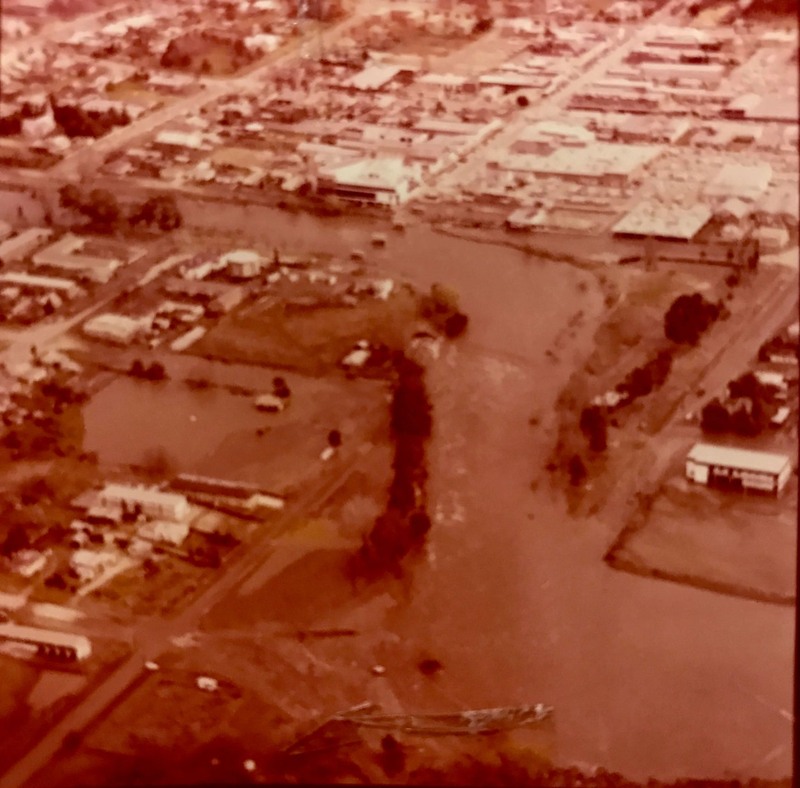 Recently Curious Canberra questioned the truth to the rumours of the 1974 flood, asking ArchivesACT to assist in finding an answer. The records we uncovered provide a window into a number of flooding events. Each of these 1970’s events warranted close attention by the National Capital Development Commission (NCDC) as they were considered to be ‘exceptional’ in nature. Records detailing Exceptional Floods in the ACT are the October Find of the Month. The NCDC commenced in 1958 when the residential expansion of Canberra had reached the limits envisaged by the Griffin Plan. A planning report by the Commission was released in 1959 outlining a scheme for expansion, fashioned under the pattern of urban centre development where Woden would be the first satellite town centre. 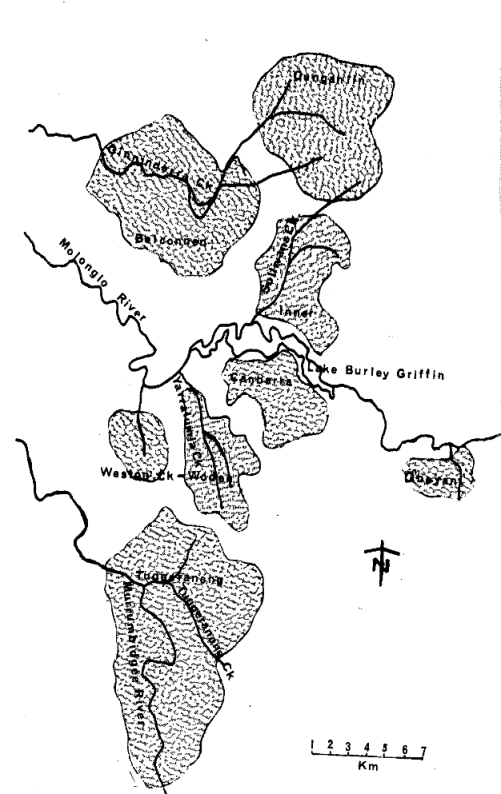 The Woden Valley topography largely determined the plan for Woden as the Yarralumla Creek divides the valley, meaning housing would have to be on either side of the creek and arterial roads needed to be generally parallel with it. 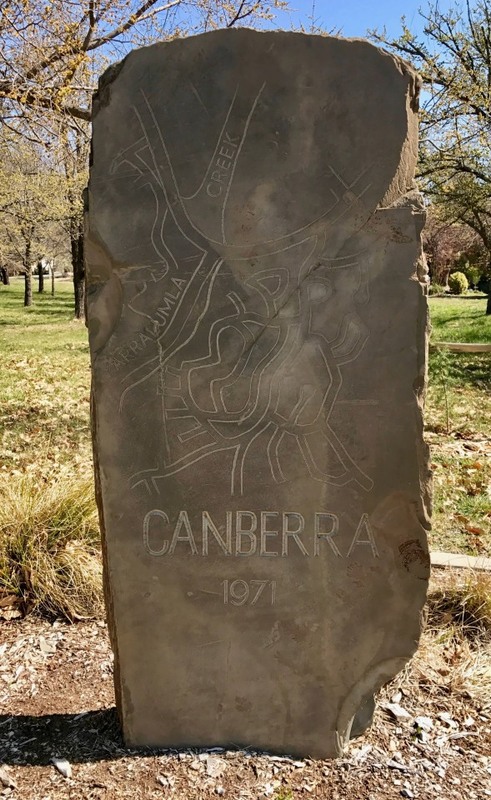 In 1961, a detailed study of the drainage of the Yarralumla Creek catchment was carried out to consider the basic principles and standards necessary for the design of the drainage system; this in turn defined the planning of roadworks and parklands. The recommendation for open drainage to cope with 10-year flood events, along with surrounding open land to withstand a 100-year flood event, was adopted. This was consistent with stormwater design devised for the Territory and held up as exemplary by the Institute of Engineers. 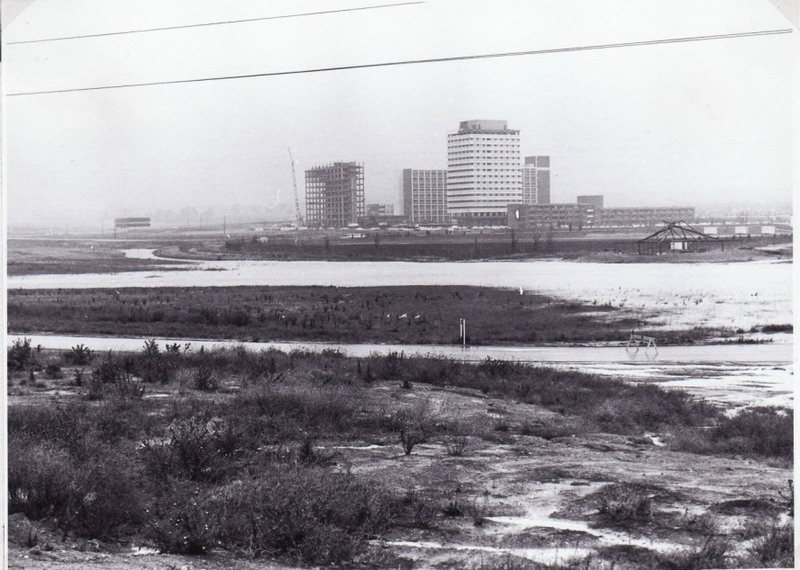 Land servicing in the Woden Valley commenced in May 1962. By June 1964 there were a thousand people living in the Valley, mainly in the suburb of Hughes. The Woden town centre began construction in 1968 and by 1970, apart from Isaacs and O’Malley, the majority of the planned region was complete with approximately 33,000 people calling it home. At around 7.45pm of Tuesday 26 January 1971, a severe thunderstorm hit the Woden Valley. In less than 50 minutes a substantial amount of rain fell, with the heaviest over a narrow zone to the east of Mt Taylor and close to a drainage channel associated with the upper reaches of Yarralumla Creek. The Bureau of Meteorology estimated that a total of 3.5 inches (88.9mm) of rain fell during this period, but private rain gauges in the suburbs of Torrens and Farrer recorded in excess of 3.75 inches (95.25mm). The most notable thing about this particular storm is the way it remained almost stationary for an extended period of time, rather than rapidly moving across the region as is more usual in Canberra. Heavy run-off through the drainage channels created major flooding over roads, even in elevated areas of residential suburbs. With the speed of the flood it didn’t take long for a number of incidents to occur. At the junction of Beasley Street and Basedow Street in Torrens a bus was turned 180 degrees and carried across the road. At the Cotter Road crossing of Yarralumla Creek, a person was rescued from the rushing waters. On Melrose Drive in Torrens people caught up in the unexpected surge had to be freed from their cars. The most devastating events of the flood took place around the intersection of Yarra Glen-Yamba Drive-Melrose Drive. It was here that three separate vehicles, carrying at total of seven passengers, were swept away, killing all occupants. The timing of each accident is somewhat hazy but the dominant feature is the rapid rise of flood water. The first car, a Vauxhall Viva sedan carrying five passengers, was driven by Carmel Smith. She was following a car driven by her father, Benjamin Smith, along Yamba drive and turning west into Melrose Drive. Mr Smith believed there was only a thin film of water covering the road when he negotiated the Yamba Drive intersection. He realised his daughter was no longer behind him while turning into Launceston Street so drove back towards the Yamba Drive intersection. Mr Smith was to find that his daughter’s car had been carried away into the flood water, and only three of the five occupants could be seen. Two of the passengers in Mr Smith’s car attempted a rescue. Kevin Seymour, father of two of the children, and Peter Smith, brother of the other two children entered the floodwater only to find themselves in difficulty. They both managed to cling to a light pole until they were rescued but in the meantime, the other three were swept away. The Vauxhall Viva was later recovered on the verge between the two carriageways of Yarra Glen, approximately 300 yards (274m) north of the Yamba Drive-Melrose Drive intersection. The bodies of all five victims were recovered in different parts of the Yarralumla Creek between the 27 and 30 January. There is very little known about the circumstances regarding the disappearance Lon Cumberland. Members of the Canberra Fire Brigade noticed a vehicle in Yarralumla Creek approximately 150 yards (137m) east of the McCulloch Street Bridge in Curtin. They went to investigate only to discover the car was empty. Mr Cumberland’s body was found in the Molonglo River four days later. The third vehicle to get into trouble in the same floodwaters was a Porsche sedan driven by Roderick Dumaresq Simon. Eye witnesses said that he was in the south bound carriageway of Yamba Drive, about 200 to 300 yards (182 to 274m) south of Hindmarsh Drive. The water was around 2 feet (60cm) and flowing across the road. He attempted to cross the median strip to enter the north bound carriageway. The car was last spotted moving towards the channel of Long Gully Creek on the western side of Yamba Drive. Mr Simon’s body was recovered in the Molonglo River on 27 January. The fact that the road and drainage facilities provided on one of Canberra’s major expressways have proved completely inadequate under conditions of severe stress – and that a total of seven people are suspected of having died as a result – is in itself a monstrous state of affairs. But the added fact that this should have happened in a planned city that has been held up to the world as a model of design and engineering is galling indeed. The NCDC report into the investigation of the flood stated that the low-level crossing of Yarralumla Creek at Melrose Drive and Yamba Drive had been in operation since April 1967 and did experience some infrequent flooding which restricted traffic. The Minister for the Interior, Ralph Hunt, told Parliament when tabling the report “In such a situation, nothing could have been done to prevent the tragedies…Even those present at the scenes of the tragedies from the outset were unable to help the victims.” The report concluded that while work on the drainage system was completed to accepted standards, more work could be done. Flood remains one of our most deadly weather events. The seven lost on that night are remembered through a memorial near the site. Heavy rain fell over much of south eastern NSW from Monday 26 August to Wednesday 28 August 1974, including the Territory region, filling all of the main tributaries. Four of the five gates for Scrivener Dam were opened up to cope with the amount of water flowing into Lake Burley Griffin. On 29 August, NCDC staff surveyed and photographed the flood damage from the air and an interim report was prepared. It was noted that flooding had occurred in The Causeway, the low level of Dairy Flat Road was overtopped and had severe damage, and flooding around Duntroon meant that traffic had to be diverted from Morshead Drive. The Queanbeyan township was badly flooded as the Queanbeyan River became increasing swollen, with the peak flow reaching the same level as the previous record flood in 1945. The bridge across the river was under water and badly damaged, effectively cutting the town in two. There were concerns by the Queanbeyan Council that “the east side of the city could have serious problems if an accident of any sort occurred, because the 24-mile drive from the west to the east side would mean an extra hour to ambulances or fire brigades” . The caravan park had to be evacuated and the brand new Queanbeyan Leagues Club, having only been open for three days, found water 2 metres deep in its cellar, which ruined food, liquor and equipment. But the most gruesome result of the 1974 flood was the extensive flooding of the Queanbeyan Riverside Cemetery. The Member for Monaro, Mr Steve Mauger, said after his inspection of the city that almost all of the cemetery was completely under water. It was absolutely tragic to see…Coffins and bodies were afloat, and I would say that not one of the graves was left untouched. When I was watching this afternoon, about 20 feet of the bank fell into the river, and I was talking to one couple whose parents’ graves had completely disappeared. A week after the event, Inspector Percy Hale of the Queanbeyan Police denied rumours that bodies had been recovered from Lake Burley Griffin. But he did confirm several bodies had been recovered from the Queanbeyan River with the assistance of the ACT Police. Estimates vary on how many graves were actually lost in the flood, as earlier flood events were also responsible for breaking up and washing away both graves and headstones, although it could have been as high as 100. Some reports say that 63 bodies and body parts were eventually reburied. Many of the lost remains would never be recovered due to their age or because they are potentially buried beneath a part of the cemetery that had subsided from past erosion. The rumour of the bodies in Lake Burley Griffin continues to persist 43 years on, with stories circulating of bones still embedded in the mud at the bottom of the lake. 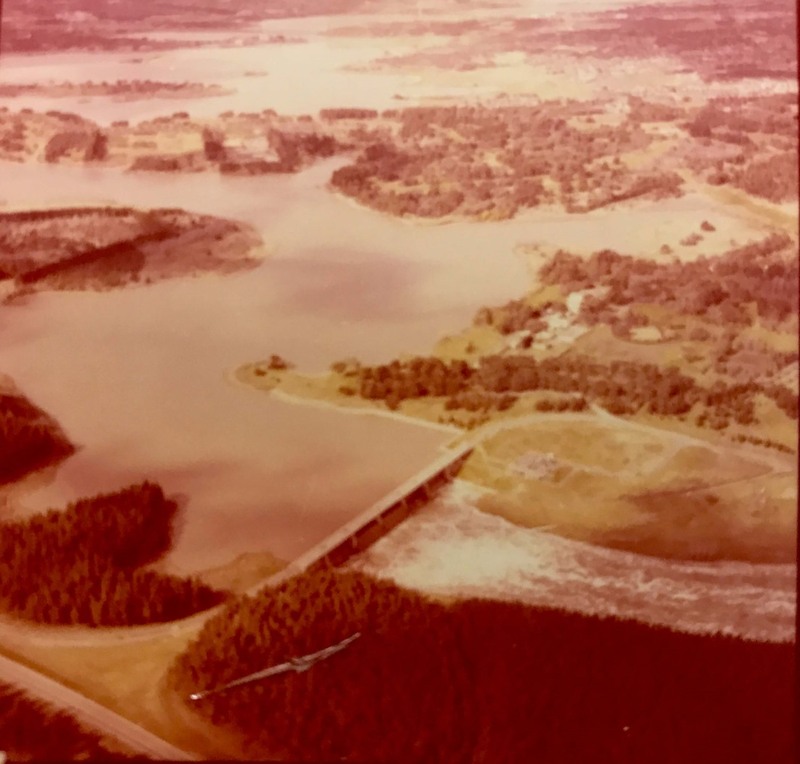 The susceptibility of flooding on major Territory infrastructure was once again challenged on Saturday 16 and Sunday 17 October 1976 when over 200mm of rain fell in the Queanbeyan River and Molonglo River catchments. Flood events of this kind are unusual for October and were estimated as a 250 year frequency event. 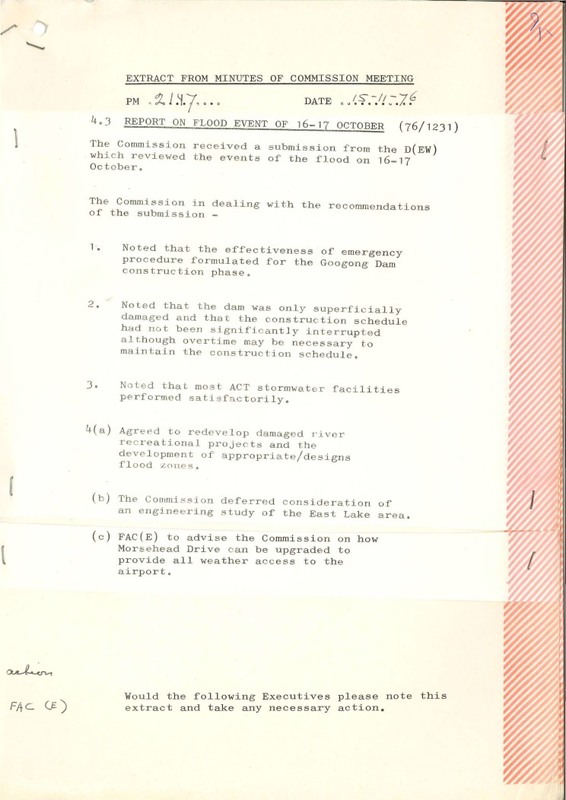 During the morning of the 15 October 1976, a “Flood alert commenced with a confidential warning issued by the Bureau of Meteorology at 0945” to the Commission. Their attention quickly turned to Googong Dam and questions of whether it would withstand the large volume of water. 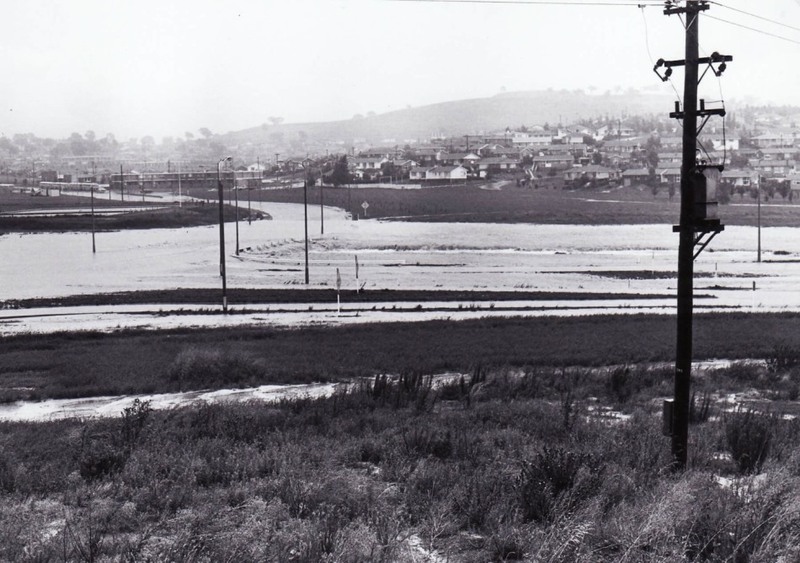 The dam, created with an uncontrolled spillway, was still under construction and would not be completed until 1979. There was genuine concern the unfinished dam could collapse, inundating all of Queanbeyan and portions of Canberra within minutes. This early alert gave the building contractor, Thiess Bros., time to carry out work to best improve the safety of the dam. As a precaution, the State Emergency Service (SES) evacuated approximately 5,000 Queanbeyan residents to emergency accommodation. The ACT Police did the same for approximately 1,000 residents from the low-lying areas of Oaks Estate, Narrabundah and The Causeway. Ultimately, Googong Dam survived the deluge. Inspections were carried out after the water had subsided which indicated that the damage sustained by the dam embankment was only slight and that construction could resume immediately. Assessments were also made of all stormwater facilities in the Territory and these were considered to have performed ‘satisfactorily’ during the flood event. The main issues were in the Dairy Flat area and on Yarra Glen. Other aspects of how the overall emergency procedures during the flood event were also investigated. Could any of these have been the missing bodies from 1974? ArchivesACT hopes you have enjoyed this look into three major flooding events in the ACT region. If you have any images or memories from this period why not tweet about it and don’t forget to include @ArchivesACT. If you are interested in finding out more about these records please contact ArchivesACT through our “Request a Record” service. 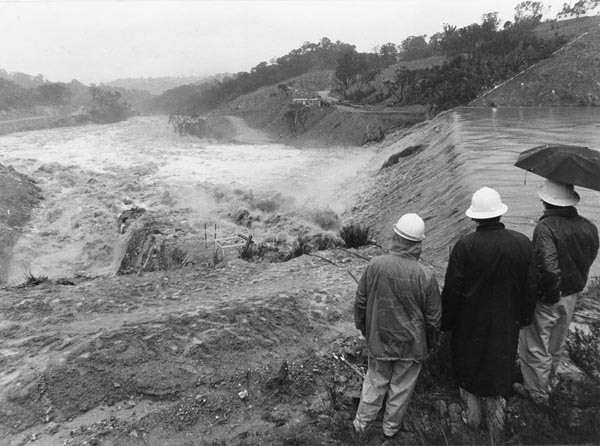 Woden Valley, Canberra, Flood of 26 January, 1971; The Department of the Interior. 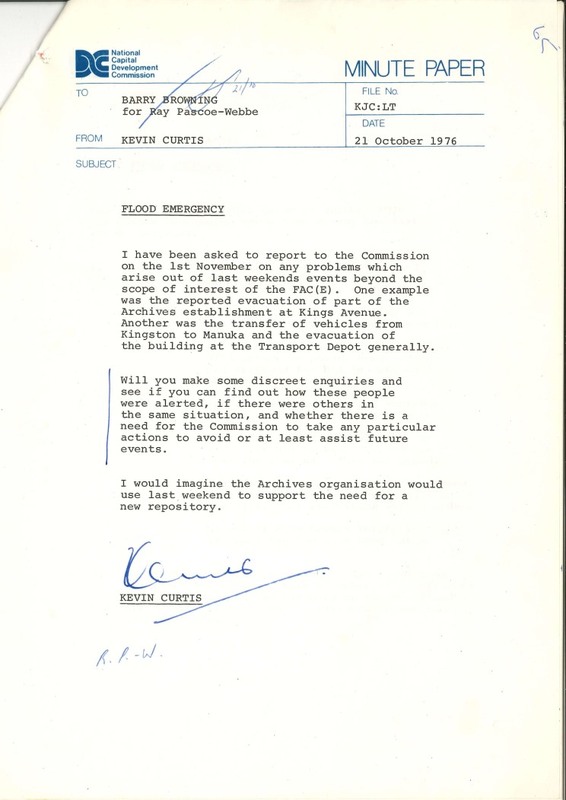 Canberra: Australian Government Publishing Service, March 1971. Woden Valley Flooding: Report on the Design and Construction Aspects; National Capital Development Commission. Canberra: Australian Government Publishing Service, March 1971. Final Report, Woden Valley Storm, 26 January 1971; Commonwealth Bureau of Meteorology. Canberra: Commonwealth Bureau of Meteorology, January 1972. Trunk Stormwater Design in the ACT; Higgins, W.L. ; Sydney: Institute of Engineers, Australia, 1974. Queanbeyan: City of champions; Overall, Nichole. Queanbeyan, NSW: Nichole Overall, 2013.